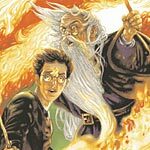 The New York Times has a new interview with actor Jim Dale about the work he does recording the audio books of the US editions of the Harry Potter novels. In this new article, Mr. Dale says after completing his work for the Harry Potter and the Deathly Hallows audiobook, he of course knows the ending to the series (“It’s a surprise ending,Let’s say that”) but says he will not be spoiling anyone by revealing the outcome of the book. “Mr. Dale signed a confidentiality agreement so that he will not breathe a word of the plot. But after spending eight years creating more than 200 voices for all the characters in the “Harry Potter” books, Mr. Dale really believes that readers ” and listeners ” should discover the end for themselves. “Deathly Hallows’ which runs to 784 pages in the ink-and-paper version, took about two and a half weeks, working six-and-a-half-hour days, recording about 18 to 20 pages an hour, to finish. As with the other books, Mr. Dale received the manuscript only two or three days before he was scheduled to begin recording. “That makes it impossible for me to actually read it before recording it’ said Mr. Dale, who does not possess the 13-year-old megafan’s ability to inhale the book in a weekend.